For the last two years (as I’m sure you know), we’ve been working diligently to make MAAG a place where artists can learn, create, and grow together – a place where both art and community are fostered. Today, we stand closer to that goal than we’ve ever been before. Our doors are open, the gallery walls are up, and even our bathrooms are becoming a reality! During this exciting, transitional time, we’ve even managed to host numerous events: Exhibits, Dances, Breakfast Clubs, Markets, and most recently, Mural Arts Community Paint Days. Yet, none of this would have even been possible without the encouragement and guidance of our dear friend, mentor, and avid photographer, Solomon Levy. A staple to the Northwest landscape, Sol resided in Mt. Airy for over four decades and had played a leading role in many community organizations such as Weavers Way, Habitat for Humanity, Mt. Airy Learning Tree, Project Learn, and others. As MAAG’s Vice President and founding Board member, Sol Levy was instrumental in making our dreams a reality. After all, it was Sol who discovered our incredible space here at 11 W. Mt. Airy Avenue – who saw past twenty-odd years of dust and envisioned a bustling center for the Arts. When doors were closed to us, he opened them; when we got stressed, he reminded us that nothing worthwhile was ever easy. Sadly, Sol left us too soon (nearly a year ago at this point); yet, his legacy will carry on forever through his memory and art. 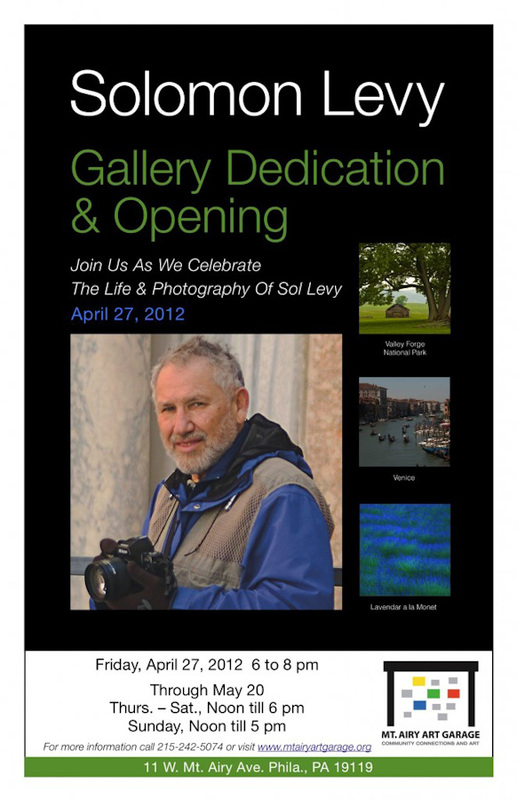 So, join us for the opening reception and dedication of our permanent gallery, the Solomon Levy Gallery of Art, on Friday, April 27, 2012 from 6-8PM. The Gallery’s first exhibit, “Travels Through Life,” will feature Sol’s work and will span his earliest landscapes through his most recent abstractions. Whether capturing the grand terrain of Europe or a few inches of cracking paint on a city door, no scene was too vast or insignificant for Sol’s lens. All work will be for sale. Sol Levy’s “Travels Through Life” opens on Friday, April 27th and continues through May 20th. Regular hours are: Thursday – Saturday, Noon till 6 pm and Sunday, Noon till 5 pm. In addition, private appointments are available. Come celebrate the legacy of Sol Levy’s retrospective photography. What better way to celebrate his life among so many friends and family than with the dedication of our new gallery! Join us! Cocktails, and Dances, and Markets – Oh My! Over the last few weeks, we’ve been hosting a slew of events: A Valentine’s Day Dance Party, a Winter Cocktail Fundraiser, a Funky February Art Market, and a handful of Artists’ Breakfast Clubs. 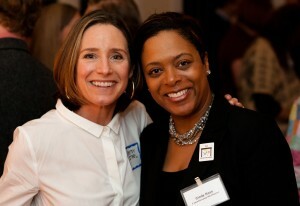 Undoubtedly, we’ve enjoyed these events just as much as the people who attended them. Whether we were dancing on our concrete floors for equality, enjoying the premiere of MAAG’s very-own theme song by St. Mad at the lovely home of Frank and Betsy Steel, or supporting local artists through conversation and collaboration, a great deal of laughter and fun was had. Yet, in the midst of all these happenings, we’ve been pushing full steam ahead with one very substantial, serious goal in mind: Opening our doors full-time. 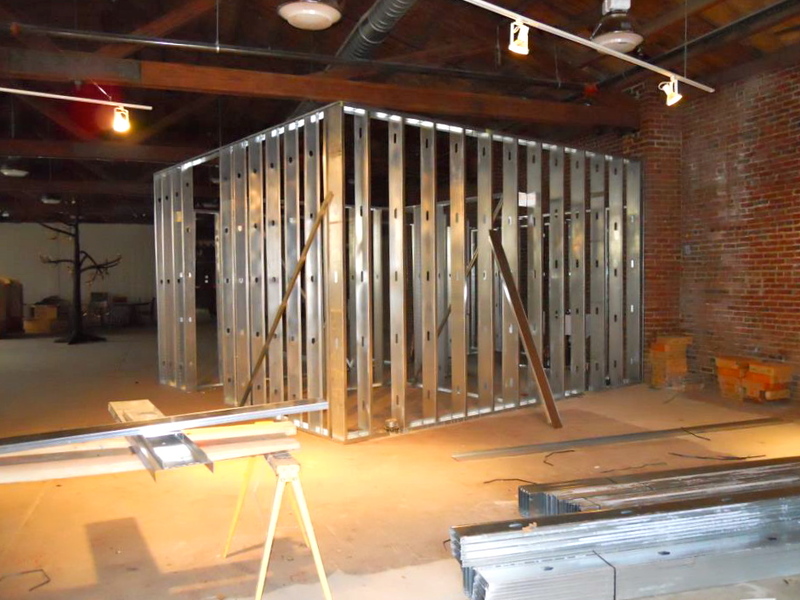 However, before we can do that, we must first complete the second phase of our construction – our bathroom buildout. Thanks to the generosity of those who attended our Winter Fundraiser (please see our “Thank You” letter here), as well as a $10,000 matching donation, we’ve been able to start this second phase which will include two handicap-accessible bathrooms. Although this fundraiser catapulted us towards our goal, we’re not quite there yet. That being said, we still need your sustained support and generosity. If you haven’t donated to our Building Fund, please consider it by clicking on the aforementioned link or downloading this pledge form. If you’ve already donated, please consider a second time ‘round. And if donations aren’t your thing, perhaps a membership is more your style. Regardless of which type of support you may choose, every donation (no matter how great or small) pushes us closer to opening full-time – and for that, we’re eternally grateful. http://mtairyartgarage.org/wp-content/uploads/2012/03/resizedphoto2-300x206.jpg 206 300 Arleen http://mtairyartgarage.org/wp-content/uploads/2016/06/maag-in-action_main-1024x274.png Arleen2012-03-11 23:22:392019-01-30 15:08:37Cocktails, and Dances, and Markets - Oh My! What is Funky February at the Mt. Airy Art Garage? Why it’s a celebration of local talent! Want to find out what some of your favorite artists have been up to? Then stop by 11 West Mt. 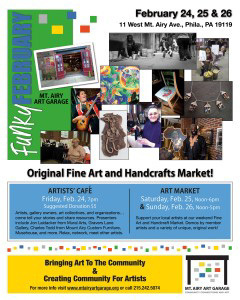 Airy Avenue this weekend to celebrate the arts, and support your local visual and performing artists. Friday night, Feb. 24 at 7 pm we’ll launch the weekend with our Artists’ Café—a place to hear what other artists are up to and share information. You know us, MAAG is the place where artists come to tell their stories…people like Charles Todd (Mt. 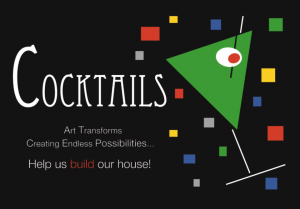 Airy Custom Furniture), Karen Lightner (Philadelphia Center For The Book), Jon Laidacker (MuralArts), Profiles Studio, Gravers Lane Gallery, Kathleen Bonnano (Musehouse), and more! $5 suggested donation at the door and open to all artists. Then Saturday, Feb. 25 from noon–6pm and Sunday, Feb. 26 from noon–5pm celebrate the new winter creations of our member artists. Glass blowers, painters, photographers, ceramic artists, you name it. Our gallery will be stocked full by our members to delight your eyes. Admission is free and open to the entire family. 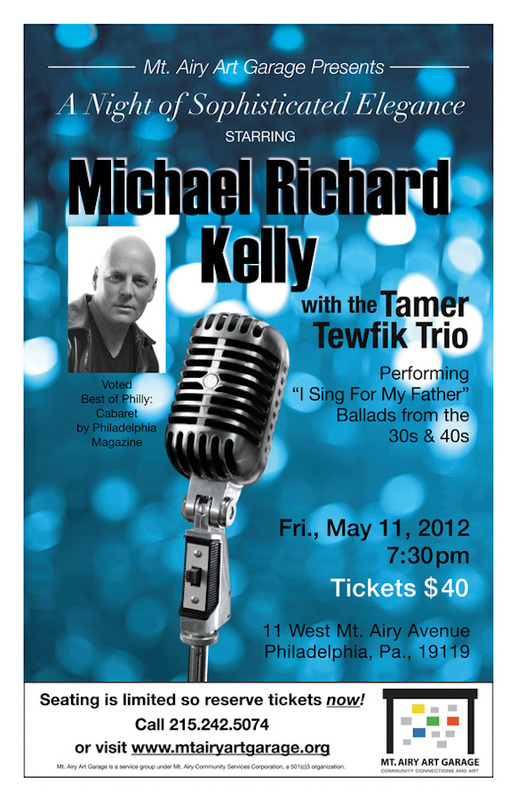 We’ll be rockin’ it in West Mt Airy starting with the Friday Night Cafe. No February slump this weekend. 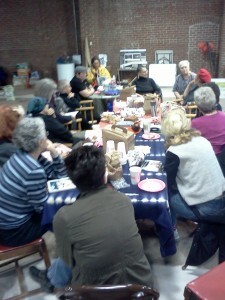 Friday’s Cafe is all about our community and the artists within that circle. Here are a couple of pictures from last year. The Friday Cafe talks were such fun last year … here is MAAG artist and Dumpster Diver Ellen Benson with a before and after on one of her found object sculptures. Ahem, there was a dreadful picture of me talking about MamaCITA absolutely no reflection member and photographer Alix Passage (but since I’m writing, you won’t see that picture). Keep you eyes here! More to come. Well, we had another stimulating Artists’ Breakfast! We had two local artists present their stories as well as some of their work. 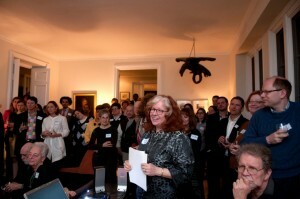 The first was Steve Segal, an editor, wordsmith, visual art director and designer of books in addition to being a writer. He combines form and function believing that “language is the art.” Steve currently works primarily with small book publishers of fantasy and fiction although previously he has run magazines. In his job at Quirk books, he edits books, designs book covers and serves as curator as he matches creators with projects (often using the online social gallery communities such as “deviantart.com”). Steve shared several books that he had developed with the group. The absolute show-stopper was a stunning and creative boxed accordion book entitled “The Thorn and the Blossom” by Theodora Goss. It contains two stories utilizing the same characters. When read in one direction it conveys a love story; the other, a murder mystery. This is modeled after one-of-a-kind books created by artists. It had just been published the day before and made a huge impression on the group. Discussions about the costs of creating books and projects ensued along with marketing ideas. Many questions followed and ideas were percolating. An equally impressive artist, Arleen Olshan (www.arleenolshan.com) has her studio set up in the Mt. Airy Art Garage. She proceeded to describe her training at Fleisher, PAFA, and PCA and multiple paths she had travelled in the art world which led her to creating custom hand-sewn hand-dyed leatherwork, utilizing gemstones and glass as decorative inclusions. It all began years ago when she needed a pair of sandals! Having recently retired from her day job as a drug and alcohol counselor with women and children in recovery, she set about working on her life-long dream to establish MAAG, a community-based center for the visual and performing arts. Arleen shared some of her accomplished representational portraits with the group and talked about utilizing our local shop PROFILES (www.profilesstudio.com), in Chestnut Hill to create huge digital scans of her work. As necessary tools and suppliers become scarce for Arleen’s craft, she mentioned a need to replace a tool used for punching holes in the leather. Someone mentioned that there is a shop in or around Northern Liberties which utilizes digital drawings to create 3D tools from a hard plastic. Our next MAAG Breakfast Club meeting will be as always, the third Thursday of the month 9-10:30 am. February’s date is this Thursday, February 16. See you then! Valentine’s Dance This Sunday, Feb. 12! Valentine’s Day weekend is the celebration of love for some, and the cause of lament for others. I’m not talking about that special sense of loathing shoppers and singletons suddenly find for chocolate, chalky hearts and all things pink. It’s a time of year that we remember that even though love and commitment know no gender, not all couples are allowed to marry. As we come closer to the day where all couples may wed, at Mt. Airy Art Garage (MAAG) we celebrate all couples’ right to wed on February 12, National Freedom to Marry Day. 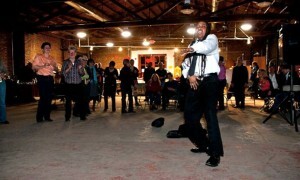 MAAG’s Valentine’s Day Dance Party begins at 4 pm and ends at 8. $10 at the door and the musical stylings of DJ Lucky 7 will keep you dancing all night long. Come for the dancing, stay for the fun. All proceeds go to MAAG’s building fund. Say “I do” to MAAG’s Valentine’s Dance Party! And come delight in the fabulous Valentine’s cake created for us by Little Jimmie’s Bakery where the baked goods make us swoon. http://mtairyartgarage.org/wp-content/uploads/2012/02/Valentines-Flyer-FB-only-231x300.jpg 300 231 Arleen http://mtairyartgarage.org/wp-content/uploads/2016/06/maag-in-action_main-1024x274.png Arleen2012-02-06 20:18:482019-01-30 15:16:10Valentine's Dance This Sunday, Feb. 12! If you’ve been reading our blog, then you’re aware the MuralArts Program has begun the process for the Germantown mural at 310 W. Chelten Ave. We invite you to share your vision for this mural—whether you create a drawing, bring a photo, share some historical information, bring a sample of your artwork, or bring something special to share with MuralArts. What does Germantown mean to you? For me, I have a vision of the Germantown High School Stained Glass Project students being represented on the wall—their work, their photos, their victories. And I have a funny feeling they just may be there. 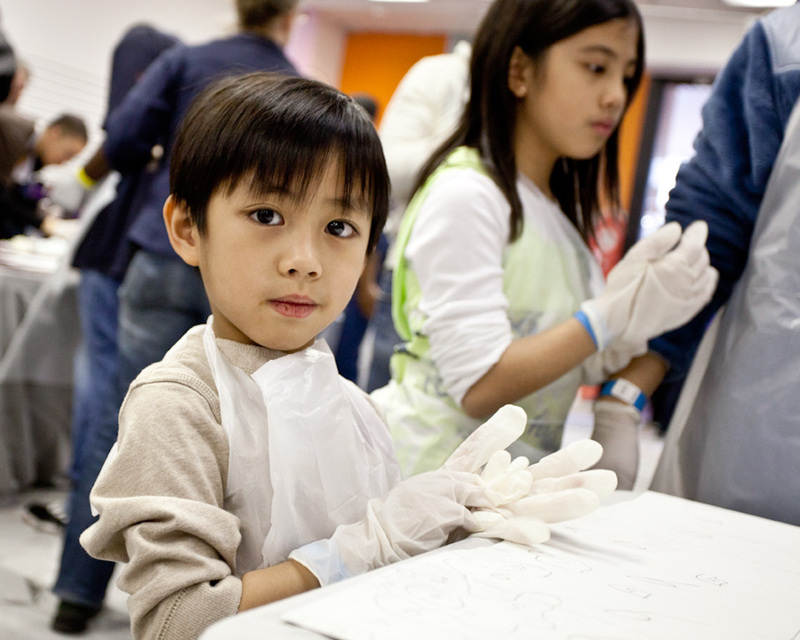 Our next community artmaking workshop will be this Saturday, Jan. 14, at 5534 Pulaski, from 10am – 2pm. No you don’t have to stay for four hours. Stop by, make your contribution, hang with your neighbors and artists. Please come, bring your families, your neighbors. For those of you who are teachers, bring your students. All ages—the only requirement is spirit and enthusiasm, no artistic experience required! Just art materials, tables to draw and create, and high energy. Spread the word; don’t miss this opportunity to create something so very special. 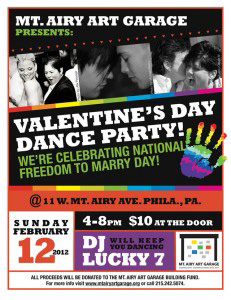 Celebrate National Freedom to Marry Day At Our Valentine’s Dance! might know her. Rumor has it we may have some other guest DJs. 2. Fashion statements—YO! informal or whatever mood suits you. 3. Hours—it’s a tea dance. 4-8 pm so you have no excuse. park in the lot at Valley Green Bank. We’ll have folks at the door to help direct you. and celebrate marriage equality for all. And yes, SHARE THIS EVENT! http://mtairyartgarage.org/wp-content/uploads/2012/02/Valentines-Flyer-FB-only-231x300.jpg 300 231 Arleen http://mtairyartgarage.org/wp-content/uploads/2016/06/maag-in-action_main-1024x274.png Arleen2011-12-05 11:36:292019-01-30 15:14:36Celebrate National Freedom to Marry Day At Our Valentine's Dance!